STAVELY, Alta. 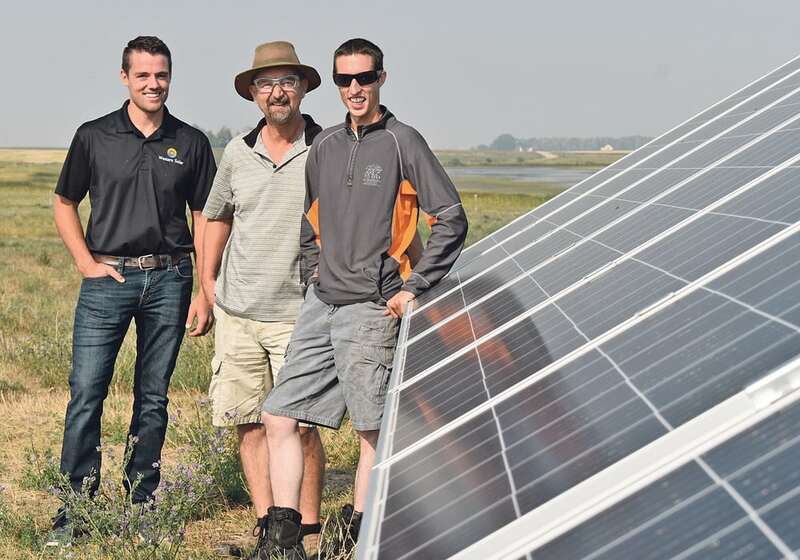 — Three separate farming operations east of this southern Alberta town have co-operated on a 313.56 kilowatt project that will use the sun to power pumps for their irrigation pivots. Lamb Farms Ltd., Roemmele Farms Ltd. and Lilybrook Herefords Inc. turned the key last week on an installation designed and erected by Western Solar of Calgary. Electricity is a major expense when it comes to irrigation. Ron Lamb, a partner in Lamb Farms, said last year it cost $45 to $50 per acre, an all-time high because of high electrical rates and dry conditions that required a lot of irrigation. He expects to pay about that same amount this year, given that the solar system was just installed and the irrigation season is waning as harvest nears. Even so, Lamb said he expects his part of the system will be paid for through energy savings within five to 10 years, with a similar payback period for the other farm operations involved. He and his farm partners have about 1,200 acres under irrigation and among the three farm operations, there are 20 to 22 pivots. The solar panels produce enough power to run pumps for three pivots a time. “We’re producing about 75 percent of our usage throughout the year and the other fellows are designed about the same way,” said Lamb. Co-operation between three separate farm entities, some of them with multiple partners, may seem like a daunting proposition but Lamb, Roemmele and Lilybrook already have experience working with each other. They all worked with the Alberta government years ago to establish an irrigation project from Clear Lake, a water body about five kilometres long and two km wide that is popular for boating and fishing. Lamb described it as “a slough in dry years and a lake in wet years,” until the diversion from upstream rivers resulted in steady water flow in and out of the lake throughout the summer irrigation season. The system required various pipelines crossing the three farmers’ properties so co-operation was needed. When Lamb started pondering a solar system, it wasn’t a hard sell. “I’d been tinkering around with the idea of solar panels all winter and I finally was fortunate enough to get hold of Dan (Visser) at Western Solar and he kind of outlined how a solar project would work in conjunction with … irrigation,” said Lamb. “It looked like a really good thing for our farm. I talked to both the Roemmeles and Andy (Schuepbach of Lilybrook Herefords.) We sat down and had a meeting and in short order, about a week later I think, it seemed like a good deal so Western Solar designed it. The three farms will take advantage of the Alberta Agriculture On-Farm Photovoltaics Program, which provides grants based on the size of the project. Visser said each of the participating farmers is eligible for funding and the amount varies according to number of kilowatts. The project was among the larger ones recently undertaken by Western Solar, which has also installed systems for southern Alberta chicken, hog and feedlot operations. In this project, Lamb Farms has 96.48 kW, Roemmele has 144.72 kW and Lilybrook has 72.36 kW. That capacity is generated by 936 solar panels on a few acres at the south end of Clear Lake. “Any one of those would be average for us but the three put together was definitely a big project,” said Visser. Irrigation projects are 30 to 40 percent of the Western Solar business now as farmers take advantage of government grants. Without those, payback on the systems would take longer. Power produced beyond needs goes back into the grid, though that amount is much less in winter simply due to the sun. Lamb said government grants were among the selling points for the solar install, although they are limiting in one important way. “There’s constrictions in terms of how big we could go and how much we can put back in the grid. It would actually be nice to go bigger but we’re capped by government rules.